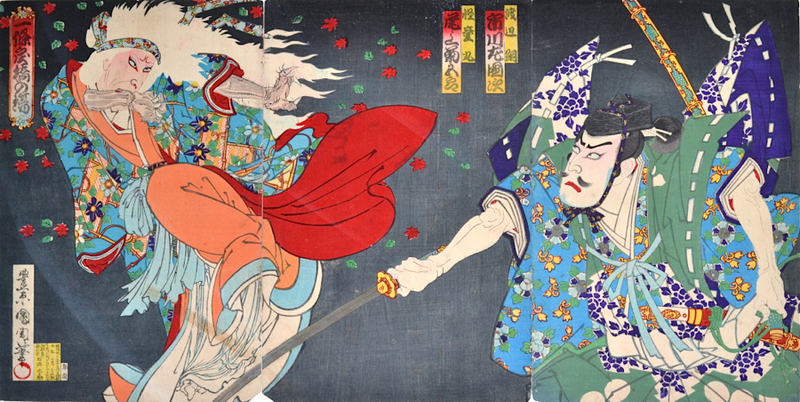 Toyohara Kunichika (1835-1900) The Demon Ibaraki, 1890. Oban Triptych. Click here for a third detailed enlargement. 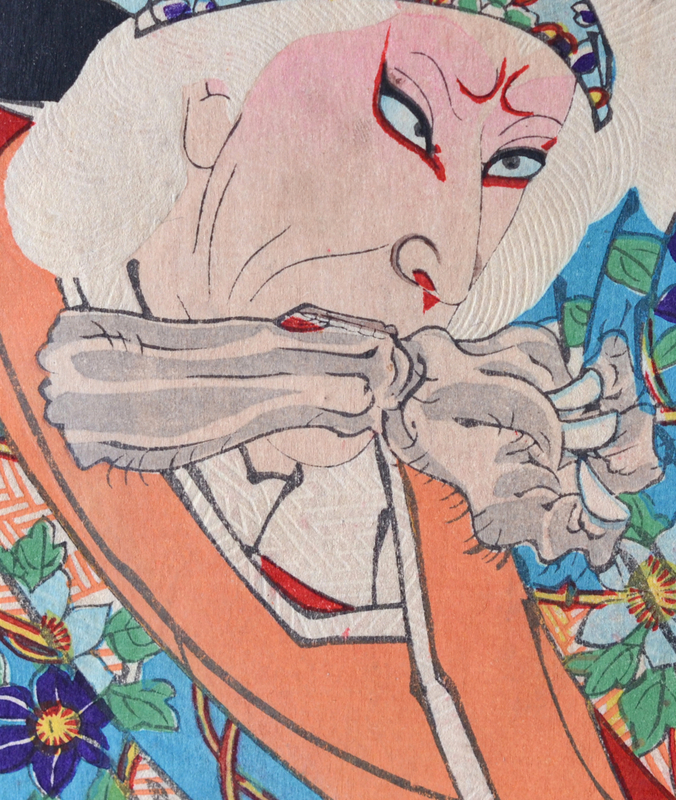 Amy Reigle Newland, the foremost expert on Kunichika, describes this print in her book Time Past and Time Present: Images of a Forgotten Master, as, “Kunichika’s most striking Ghost print…”. It is a famous and magnificent piece, his best and one his most well known triptychs. By way of comparison to the Toyokuni triptych shown earlier, it is easy to see how Kunichika has innovated the triptych format from its one character per page tradition, here stretching the character of Watanabe no Tsuna across the right and centre sheet. The play, Ibaraki, is a dance drama conceived in 1883. It is based on an old folk tale about the infamous demon of the Toji Temple. Tsuna, a retainer of Raiko Minamoto, is sent to kill the demon but only succeeds in cutting off her arm. He returns home and locks the arm in a trunk. An old woman calls at his house, announcing herself as his aunt. She proceeds to dance her life through the four seasons, finally enquiring about the contents of the trunk. Tsuna posts the guards at the doors outside and retrieves the arm to show off to his visitor. 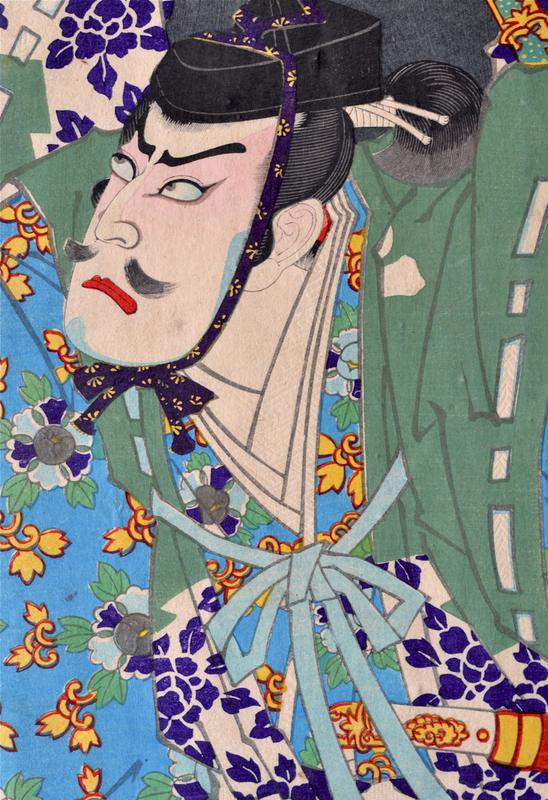 The old woman grabs the arm from him, leaving the stage and returning in the guise of the evil demon, in splendid costume and kumadori make-up. Tsuna again battles with the evil ogre but cannot get the better of her supernatural powers. She escapes and Tsuna strikes a famous pose expressing his frustration as the curtain is closed. Now alone on the hanamichi pathway, the infamous demon of Ibaraki gloats before making her leaping roppo exit as though flying away through the air. Kunichika pictures the exciting climax. The print is a tour de force… the beauty of the lines of the departing demon - her robes, her hair, her out flung claw - contrasting with the strong diagonal of Tsuna’s stoic but fruitless pose. The play was a vehicle for the actor Onoe Kikugoro V, here shown playing Ibaraki, opposite Ichikawa Sadanji I as Watanabe no Tsuna. 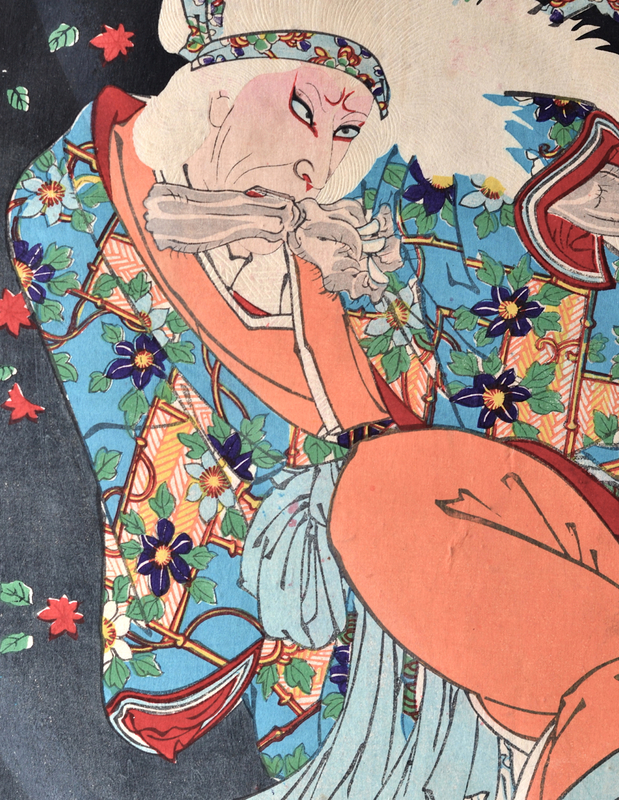 Kunichika was to go on to devote much of the 1890’s to portraits of Kikugoro who had the stage name Baiko.